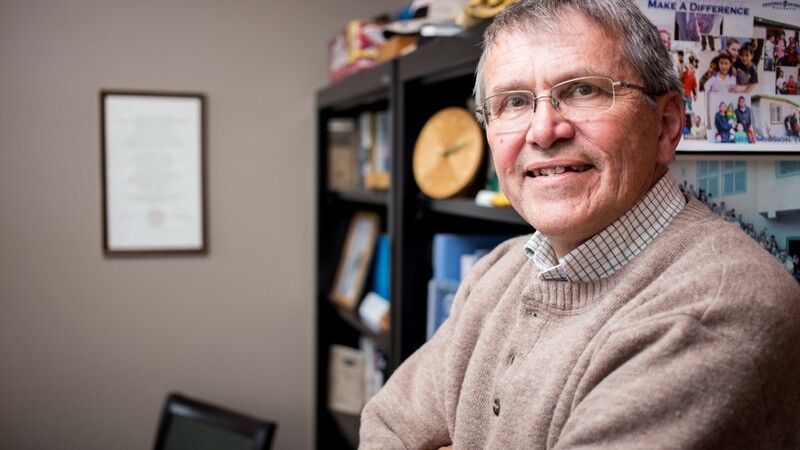 Dr. Daniel Paavola is a long time faculty member in Concordia’s theology department. He is an expert teacher both online and face-to-face. We sat down with Dr. Paavola and talked with him about teaching theology online. Hi I’m Dan Paavola, I’ve been teaching here at Concordia since 1996 both in the traditional undergrad programs, and also online for many years, almost immediately after 96. Q: Can you tell us a little bit about your academic background? A: I went to Minnesota State University; I was an English major, and a Phy. Ed minor, graduated from there. I then went to Concordia Theological Seminary in Fort Wayne for a Master in Divinity, what makes you a pastor in the Lutheran Church. I went on to Princeton Theological Seminary, in Princeton for a Master’s in Theology and then after 12 years in the parish as a Lutheran pastor I came here, began teaching, and completed my PhD at Concordia Seminary in St. Louis while I was also teaching full time here. Q: What brought you to Concordia? college. And John said, well, all right, go on and get an extra degree, and go in the parish, and God will find you at the right time. So I did that at Princeton, from Princeton went to a little 400 person town in Butternut, Wisconsin, which is a great place. Stayed there for 12 years, was pretty sure that the Holy Spirit had totally lost me and forgotten my address, and then, out of the blue, Concordia needed somebody who had Parish experience, and a degree like mine, in New Testament, and they called me. So, I’ve been here since ’96. Q: Can you describe some of the qualities you see in students who come here to Concordia? A: Our students both online, traditional, grad students, they want to learn, they don’t just want a degree, they don’t just want to get ahead in their academic pursuits to get a job. Sure, a job is important and I know there are reasons for them to take classes outside of their love of learning. But they do want to learn. They really do. And they are wonderful, interesting, people. I love going to class and being able to say, “I’ve never heard that before”, “I’ve never heard anybody say it that way”, or to see that connection. So, they are capable, creative, kind. We start every class with a prayer. What can we pray about? People don’t just pray about themselves, they say “We should remember this person, or that person”, “Isn’t your sister about to have their baby?”, etc. The prayer is really part of class, it’s not something we do before class, I mean, it’s theology class, but it becomes, in part, the class, because what’s class? Well, it’s a group of people who should care a little about each other, and then bring those cares to a God who cares a whole lot more than we do. And so, creative, caring, wonderful ideas… that’s a Concordia student. Q: How do you help students understand their vocation in life? A: You know, that sense of calling, that God has an intentional plan to match the gifts and the circumstances in which he’s placed you, is a great idea for students. I think it helps them to say, first of all, God did not make a mistake in how He created me. The talents you have, whether you know and recognize them now or not, and the situation you come from, are not a mistake. Maybe your family’s not perfect, maybe some of your experiences weren’t always helpful, at least right now, but again, put these things together with a little patience, and maybe some hope, and they’re God’s meshing together of your past, people with whom you’ve come into your own talents, and then look where you’re going to go. You don’t know that. I mean where are you going to be five… ten years from now? That’s your vocation. God’s ability to call your past, your talents, into a place that needs you. I think the words of Mordecai to Esther are just perfect. Mordecai said to Esther, “For such a time as this, you’ve been brought into the kingdom.” All of her past, all of her talents, reach a crisis point, that’s what she was made for. Now for her, it was one crisis. What we’re trying to point people to a lifetime, not of crisis, but of saying, “hey, I see this coming together.” That’s our hope. And people see it. Q: What is the value that students pursuing a degree in another field get out of a theology class? A: I teach predominantly the Bible survey courses, or individual classes in the Bible, like the Gospel of Luke, and people coming to the those classes, right away, many say, “I don’t know much about the Bible and it’s a huge book!” I understand that, so our hope is to, first of all, give them an overview of a Bible survey course, like Heritage of Faith, or an in-depth look at all you need to know in the 24 chapters of Luke. That’s a relief to them. So here are people and actions, that many in the world already know, here’s your chance, academically, to get familiar with those same important people. But beyond that, it’s not just people, places, numbers, those sorts of things, the purpose of all this, I think John says it best at the end of his gospel: “these things are written, that you might know that Jesus is the Christ, the Son of God and believing, have life in his name.” That’s pretty minimal, but who is He? How did he make himself known through his son? Believing in Him, knowing that, you have life in His name. I know “life” is kind of a general term, but underneath that, what is the offer in that life? He says, “Peace I give to you, My peace I give”, forgiveness, wisdom, it goes on and on. Qualities that I think everybody probably says, “boy, I sure could use more patience, I could use more peace,” and that’s His offer. It doesn’t come instantly, We’d like that, but He’s got a relationship. He offers us a patient relationship that leads to, at least more of that. I think that’s what we offer. Q: What is the importance of faith across the curriculum at Concordia? A: It’s easy to teach faith in the theology class, we should get that one done no problem. I can’t speak for every class or professor, but I know they do a wonderful job. I know our professors in nursing, for instance, do a tremendous job of talking about how you care for someone when you have to deliver the bad news that the tests are not good, or the surgery did not succeed. You can’t do that coldly, and in fact you probably can’t face the job without some spiritual hope and care yourself. I think you’d hate the job and I don’t know what you have to say to those people. So, I know, just for example, nursing people do a wonderful job. Business… so what kind of person are you going to be? Are you going to cheat and swindle your way through life, make promises you have no intention of keeping? That’s not really not our business model, that’s not our business professors, that’s not their message. I think their message is not just, “it pays to be honest” it’s beyond that, its, “Who are you? What kind of person do you want to be?” It’ll come out in your business. Other ones that that leap to mind, art people. I mean, how do you express emotion? How about great emotions? Love… or peace… or forgiveness… or joy? Think about the possibilities of expressing that in the terms of the Christian message. I know our professors do a tremendous job with that. So, those are just three examples: nursing, business and art. I know there’s others, and I’m sure math people do it in ways I can’t quite imagine, but I’m sure they’re good at it. Q: What gives you the most satisfaction teaching here at Concordia? A: In terms of the teaching itself, I really love saying, “I’ve never heard that before.” I’ve taught New Testament, multiple sections, every semester, both online and undergrad, for nineteen years, and I ask many of the same questions. Just today while I was teaching New Testament, in fact I made a little note of it, at 11:20 this morning, one of my students put together an answer, and I said, “I have never heard that answer. I have asked that question for about nineteen years, I’ve heard a lot of answers. Nobody’s ever said it that way, with that connected to that. It was just wonderful! It really is fun to say, “I don’t know what they’re going to say.” There’s going to be this creativity out of someone, and the creativity could be very deep. You put two, three, things ideas together, wow, new vocabulary! It could just be the simplicity, the sincerity, of someone saying what really matters to them and it comes through in a way that strikes us all. You know, they’re wonderful people. You get to know a name, and a face, and then a person in a place, and then they graduate to being a person, I mean, a real person that you know. A person who you stay in touch with. Just two days ago, I talked to one of the students who was in the very first class I ever taught here, ‘96 that’s a long time ago… I called him on the phone, I had a reason to talk to him, and his wonderful wife. I did their wedding back in 2000, a long time ago… You stay in touch, and that’s the beauty of being here. It’s the people, its ideas, but not ideas, it ideas coming from really interesting people. That’s the best part. Q: What is the biggest challenge of being an online instructor? A: I think it’s the lack of the immediate. You know, I often say in face-to-face classes, “I like that look.” You can tell on people’s faces that they’ve got an idea, they’re ready to go. I can’t do that online. I don’t have that immediacy, and so we’ve got to read between the lines to a degree. On the other hand, the thing that online does, is it lets you say what you would never say in a 30 person class. I’ll ask a question that just seems to me kind of ordinary, and I’ll get answers that go on for a whole page, telling me about a family experience that I think are just tangentle to the question, but are central for them, and they go on about this and that, and that’s the challenge, but also kind of the opportunity of online. Some students would never share stories like that in a thirty person class, and thirty people probably aren’t going to patiently listen to it. But online? Well, type it up, and they don’t care. They read that and then they make a connection; that works. It’s making that connection, not immediately, but if you ask a decent question, you get authentic answers and then we began to connect. Q: How do you build community online? A: It depends on if you’re doing an individual, one-on-one course, or a cohort course. I do both, the cohort is the easiest one of course, usually I just post a question to get conversation started. Here’s a question: I listen to music almost always while I’m grading papers. I’ve got more George strait than anything else on my playlist, and my playlist for George is humongous, so it’s a pretty good guess that I’m listening to Amarillo by Morning while I’m typing out your answers. Just ask people “What do you listen to?” “Do you listen to music while you’re doing this?”Which is fine, they all feel better if I tell them right up front, look Amarillo by Morning is making me happy, and me happy is probably good while I’m grading your paper. So, let’s hear it for George Strait. Then they just start talking you can stretch yourself a little bit, Jack Brown is good too, and such, and you begin to appreciate. Or you say, “I have never heard about that person,” and you go and dutifully listen to somebody new. It’s probably not going to replace my George Strait playlist, but it’s good. So that’s just one way. You can talk about in these questions the worst cars you ever had, your worst first job, and the all-time community builder, pets. Talk about pets. You get people forever. So, you just find those things… if you can tie them to the text in question, okay! Sometimes you know you just do it for the joy of, “this week, let’s talk about…” And it works! Q: So is that something you plan out? Questions to initiate conversation? A: Sometimes when it’s a new group and I know I’m going to be with them for a while, I play those early ones, like the music, or the pets, early on, because generally, they’re a real positive thing. It creates a good feeling between people. With the individual courses, I’ll dig deeper into some interest that they’ve kind of hinted at, if I can tie into that it’s great, or I’ll just write in a comment, hoping that they read my comments to them, “Hey, that’s really interesting! I don’t know anything about that. In answer number two you talk about… da da da da da. I don’t know what that is.” And I say this, not in a “why are you talking about that?”, but more of a “tell me about that” kind of way. And off they go, telling you about weaving or something. I’ll tell you what; do that it’ll come back. You do that on week three, and by week seven, they’ll work it in again and you just kind of remember that you had this conversation again. Q: If you could tell prospective students thinking about coming to Concordia, what would it be? A: Don’t be afraid. Many of our online students, not all, are coming back to school, or they’re coming to this model, and this learning system is really new to them. Or, their facing a topic that they have avoided for their whole life. Like reading that humongous book, The Bible. Don’t be afraid. We don’t do these classes to bury you, to prove we know something you don’t, to say, “why didn’t you do this ten years ago?” Don’t be afraid. Number one, come back at whatever age you are. I was I was in my forties when I was finishing my PHD, I wasn’t sure there were two brain cells still up their working. You’ll be fine, whatever age you are, come back. Don’t worry about the Learning Management System, it can be it can be figured out. Other people have. It’ll work for you, trust me, it’ll work. You might have to contact somebody to ask a question, that’s alright. Don’t worry about the topic, you come back for a particular major you’re eager to learn about, that’s good, but you know you’ll have to take a few other classes, things that maybe you’ve said I have never and I never was going to”. I’ll be alright, because we who teach these classes know that you’re taking them as part of the core, not as the center of your target, and that’s fine. You’ll also find you’re not alone, you’ll have the same questions and experiences, many of the same reactions as somebody else. That’s good, it’s nice to have support. Even when you’re the only one who says, “well I was expecting…” or “I thought…”, that’s fine. Hopefully, the purpose of the course is not just to that you can say you learned something, but so I can say, “You know, that’s really new, I’ve never heard anyone say it that way”. I know it sounds simple to say, “don’t be afraid”, and it’s easy to say it on this side when you’re the one making the effort. But if those are things that are frightening, don’t let age, experience, the method, or the topic, put you off. Many have done very well, and there’s no reason you won’t be one of them. Just come on in. Q: What advice would you give to future online instructors? A: Ask questions that mine the experience as a people, not just the topic or a text. Ask questions that help build community, like I described earlier. Build those questions in, ask people what the best classes, best teacher they ever had in elementary school. You’re going to get fantastic stories, wonderful answers! Harness those then, into the experiences, or the topic, and your text. You find those things that are peculiar to your students let them talk about that and then say, “See, look there’s a connection between that and this text or this topic now” and I know it’s easy in the Bible, because it’s all about stories, and experiences, and people, who aren’t really any different than we are. I think the other thing is: get back to them fast. If you can write to somebody within 6-8 hours of them posting their answer, they still remember that answer, and get back to you. Not that you have to answer everything in six hours, but you know try to do it every day, and people will stay on task, and they’ll remember what they wrote, and the fact that you’re writing back about it just makes a connection and it doesn’t increase your work, you’re going to do it anyway, might as well just get it done.